The choice of chromatography resin is ultimately driven by process-economy, of which key influencing factors often include process time, buffer consumption, resin lifetime, hardware requirements, labor, and facility footprint, to name a few. MabSelect PrismA is a next‑generation protein A resin with substantially improved performance compared with its predecessors. 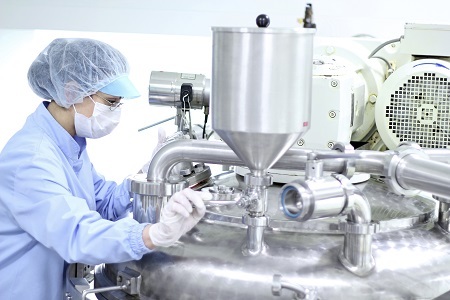 A significantly enhanced alkaline‑stability offers the possibility of cleaning the resin with high concentrations of low‑cost sodium hydroxide, to ensure a better process-economy while meeting the requirements of a stringent bioburden control. With enhanced properties of both the agarose base matrix and the protein A ligand, MabSelect PrismA also offers a notedly increased capacity compared with its predecessor resins. The improved capacity allows handling of the ever‑increasing upstream titers, resolving bottlenecks in downstream mAb processing. This process-economy simulation demonstrates the influence of dynamic binding capacity (DBC) and alkaline-stability of the resin in the design of a process, focusing on factors directly related to resin volume requirements. The predecessor resins—MabSelect SuRe and MabSelect SuRe LX resins—were included for reference.